The importance of multiscale ideas is apparent in an approach developed in statistical physics beginning in the 1970s anchored in the method of renormalization group. Modeling in this framework allows distinguishing what can be observed at the largest scale. To explain the concepts of this formalism, we describe its development in the study of materials. Central to the study of matter is that movements of individual atoms are not visible to us. Instead, we use pressure, temperature and volume to describe both what we see and how we can manipulate matter using forces. For example, a piston compressing a gas reduces the volume and increases the pressure, and heat transfer to a material causes its temperature to rise. The key concept underlying our ability to make such descriptions is scale: The fine scale (microscopic) behaviors of atoms are not important to an observer or to their manipulation of a system; and the large scale (macroscopic) properties we observe and manipulate reflect average or aggregate properties of atomic motion. This approach was formalized in the 1800s through statistical physics. It appeared to solve the problem of determining properties of a material in equilibrium by minimizing the free energy relative to the macroscopic variables. This almost always works. However, in the study of phase transitions, e.g. between water and steam or between ferromagnet and paramagnet, properties were found not to be correctly given by this method for special conditions called second order phase transition points. This phenomenon proves to be a relatively simple illustration of a complex system, where the elements act neither fully independently nor fully coherently, and the separation of scales breaks down. The phase diagram of water. 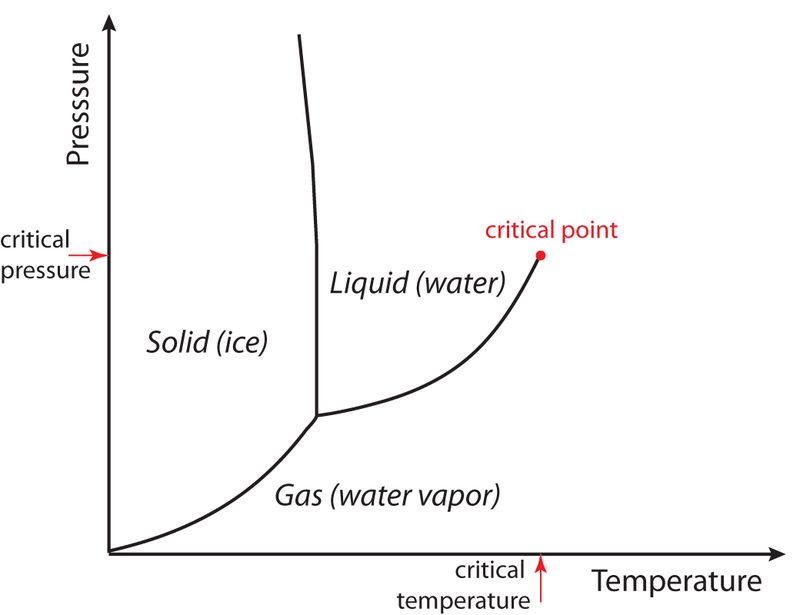 The line of transitions between liquid water and water vapor stops at the critical point (red dot). At that point the fluctuations between liquid-like and vapor-like densities extend across the system so that the system is not smooth (violating the assumptions of calculus) and averages are not well behaved (violating the assumptions of statistics). A new method that considers behaviors across scales, renormalization group, was developed to address this and similar questions. Consider the transition between water and steam. At a particular pressure we can cause a transition between water and steam by raising the temperature. At the transition temperature the density changes abruptly — -discontinuously. As we raise the pressure, we compress the steam and the change in density at the transition temperature decreases (see Fig. 1). There is a point where the transition stops, and there is no longer a distinction between water and vapor. This end point is called a second order transition point, at the end of the first order transition line. Near this point, the discontinuity of the density between liquid and gas phases becomes zero (hence the term second order transition). The way it does so has the form of a power law ρ ∝ x^β, where x is the distance along the transition line from the second order transition point. There are many other materials that have phase transitions lines that end at points, called second order phase transitions, or critical points. Power laws are ubiquitous near critical points. The exponent that was found empirically was β = 0.326. The same value of the exponent is found in many cases, including at critical points in both magnets and liquids. However, the theoretical prediction based upon free energy minimization is found to be 0.5. The derivation starts from an analytic expansion of the free energy in the density around the critical point, then setting its derivative to zero to obtain the minimum (Landau theory). This surprising discrepancy between observations and theory compelled a dramatic change in our understanding. Our usual methods of calculus and statistics fail at this point because their assumptions no longer hold true. Calculus assumes that matter is smooth and statistics assumes that averages over large numbers of objects are well defined. Away from the critical point these assumptions are justified, since the microscopic behavior of atoms is well separated from the macroscopic behavior of the material as a whole. Different parts of the material appear essentially the same, making it smooth, and any (local) average over atomic properties has a single well defined number. However, at the critical point, the density fluctuates — between water-like and vapor-like conditions — so that the material is not smooth and the average taken of the material as a whole is not representative of the density at any particular location or time. Near the critical point, the matter is composed of patches of lower and higher density, and this patchiness occurs on all scales, even at the macroscopic scale. In order to mathematically solve this problem, the renormalization group was developed. In the renormalization group method, we consider the system at multiple scales (levels of resolution). The spatially varying macroscopic density or magnetization at one level of resolution is related to that at a larger scale by performing local averages rather than a global average. This averaging relates the free energy at one scale of observation to the free energy at a larger scale. The properties of the system can be found from how the behavior varies with scale. The mathematics is not easy, but it yields exponents that agree with the phenomenology. Since its development, renormalization methods have enabled many advances in addressing questions about the structure and dynamics of materials. The reason that different results were obtained is that the free energy in this case is not just a function of the average density. Still, it is not necessary to consider interactions among individual atoms. For a liquid undergoing transition to a vapor, the free energy depends on the spatial variation of the density, i.e. how the local densities at different locations interact with each other. There are many possible interactions between local densities that could contribute to the free energy. However, only some of them are important. The renormalization group is a method for determining which parameters describing the interaction are important and which are not. “Relevant” parameters are those parameters of the free energy that increase with scale; “irrelevant” parameters are those that decrease with scale. Because there are so many atoms in matter, the irrelevant parameters cannot affect our observation. We can consider only the relevant parameters. We might measure irrelevant parameters microscopically, but they won’t affect macroscopic changes in the material or our interactions with it near the critical point.